KBR is delighted to welcome Bruce Laybourn, whose son Dylan was abducted when he was only a baby. In this guest post, Bruce shares how he managed to find a way to reach out and connect with his son through children's books. To have a child abducted is every parent’s nightmare. The agony increases when the child is taught a foreign language so that parent and child are denied even the ability to communicate. This was the sad fate suffered by my baby son, Dylan, and me. Dylan was taken from Auckland, NZ, by his Turkish mother in 2007 for a three-week holiday — and has been kept there ever since. All my considerable efforts to have Dylan returned to his homeland have failed — despite both New Zealand and Turkey being signatories to the Hague Convention on Child Abduction. Dylan was just four months old when abducted, so naturally his first language became Turkish. When I visited in the early years, we could hug and hold one another, grin and soak up the enormous love. But we couldn’t express our feelings to one another. We couldn’t Skype when apart and we definitely couldn’t email. Stories that intrigued Dylan were a sure way to ensure his English improved so we could talk to one another. I was also picking up as much Turkish as I could absorb. With Dylan having devoured every English book I had crammed into my suitcase, I decided to write my own stories for my precious wee boy. Dylan particularly loved the stories where he was a principal character. Dylan and I collaborated on many stories. He would frequently interrupt to offer ideas. Sneezle Beezle: He Runs on Diesel was Dylan’s favourite. In a reverse of what happened to Dylan, Sneezle Beezle, a robot boy, journeys to New Zealand for an apparently ordained adventurous life with Dylan. Sneezle Beezle was deliberately written in a quirky, bouncy, tongue-twisting rhyme so it would be amusing to children and fun for parents to read. 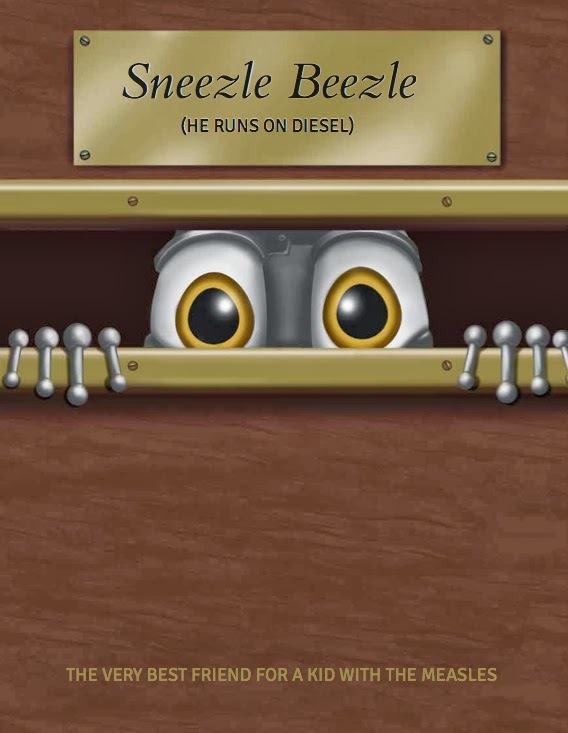 Sneezle Beezle has now become much more than a child’s imaginary friend. Dylan helped me create the character of Sneezle Beezle, even selecting the preferred 'Sneezle' from the many submitted by illustrators from around the world, who took part in an international competition to create an 'impossibly endearing robot boy'. Dylan’s favourite Sneezle Beezle was created by Vincent de Jong, a Dutch-born illustrator based in New Zealand’s Hawke’s Bay. Vincent’s own travels gave him an intimate knowledge of both the spiritual beginnings of the little robot boy in the Himalayas and his destination on the 'Island of Zed' (New Zealand), the perfect location from which Sneezle Beezle and Dylan will embark on riveting adventures together. At seven years of age, Dylan is now fluent in English (as well as Turkish and Armenian) but still loves his dad’s stories. He is working with me on the second book, Sneezle Beezle: The Secret Scroll, in which the boys unravel a mystery involving the Pacific’s last real-life pirate, Captain Bully Hayes, who voyaged the New Zealand coast in the mid 1800s aboard his brigantine, The Black Diamond. Happily, thanks to kids’ books, and the mellowing of years, Dylan and I now have a wonderful relationship through my two visits a year — in February and August — as well as weekly Skype chats. Parting is always agony, but we both know we will be together one day. Sneezle Beezle is so far only available as an eBook at the iTunes store. A print edition is planned and those interested can follow progress at the Sneezle Beezle website. Dylan’s abduction in 2007 made headlines in both New Zealand and Turkey, with New Zealand Prime Minister at the time, Helen Clark, making a direct appeal to the Turkish Prime Minister for the Hague Convention on Child Abduction to be upheld. His plight was also highlighted in a 60 Minutes special in 2008, which featured footage of Bruce's attempts to see his son that involved a clash with an armed trio who attempted to place him and Dylan under house arrest.